There is so much to see at the Ópusztaszer National Heritage Park whose location marks the birthplace of the nation of Hungary. I will mention only two of its attractions in this post. The 15-building museum village includes a school. I was pleased to see some of the authentic school supplies from around the turn of the 20th century and before. This first one is a slate students could use not only to write mathematical calculations but also to graph equations or make bar graphs! This abacus also made me smile. I would encourage you to visit Ópusztaszer National Heritage Park should you get to visit Hungary, but give yourselves more than the two hours we did to enjoy all it has to offer. 1178 is a composite number. The exponents in the prime factorization are 1, 1, and 1. Adding one to each and multiplying we get (1 + 1)(1 + 1)(1 + 1) = 2 × 2 × 2 = 8. Therefore 1178 has exactly 8 factors. 862 Look What a Little Bit of Spit Can Tell You! All four of my husband’s grandparents were born in Hungary. Recently my husband ordered a DNA kit from ancestry.com. When the kit arrived, he spit into the kit’s tube until his spit reached the indicated line and mailed it back to Ancestry. This week he received his results, and I was thrilled! I made the map below based on Ancestry’s map of his genetic communities as well as other maps showing what Hungary looked like in the 1800’s. Near the center of the map, we see a rough outline of what Hungary looks like today. When his grandparents were born, Hungary was three times bigger than it is today so I’ve made an outline to show the size of the country that they knew and loved. Places, where there is DNA similar to that of my husband, are shown in pink. The three red dots indicate the known locations of my husband’s grandparents’ births. The town names are in big bold red letters even though they were all little villages or small towns. Gyoma used to be in the center of Hungary. Now it is very close to the Romanian border. Zádorfalva is barely in the country while Szürte is barely outside. I didn’t indicate it on the map but my husband’s father was born in a little village southeast of Gyoma. It was part of Hungary when he was born but part of Romania now. This map is not necessarily about where my husband’s grandparents were born, however. This map also shows where some of THEIR ancestors lived hundreds of years ago. Even though TWO of his grandparents were born in Gyoma, the map seems to indicate that their ancestors moved to Gyoma from someplace else. Also, if my husband’s brother took a DNA test, his map would look a little different because a child receives only half of each parent’s DNA, and the half received can vary from child to child. My husband’s paternal grandfather, István Sallai, was born in Gyoma, as were his parents and grandparents for several generations. Our research goes back to the 1770’s where all of his ancestors were either born in Gyoma or else they moved to Gyoma from Túrkeve, a town 34.8 km to the north. Sallai means “from Salla”, but we are not certain where Salla might have been. Maps give many possibilities. Also, Frank Kery is one of my husband’s second cousins through this line, and he made the list of potential 2nd and 3rd cousins that the DNA test gave. That helps confirm our faith in the accuracy of the test. István’s wife, Mária Finta, was also born in Gyoma, as were many generations of her family on her father’s side. Her 2nd great-grandfather, Mihály Finta moved to Gyoma from Túrkéve where MANY people with the surname Finta have lived over the years. On the other hand, Mária’s mother was of Slovak ancestry and was born in Szarvas which is 24.4 km to the west of Gyoma. The Lutheran Church in Szarvas kept wonderful records so I was able to find most of her ancestors back to the mid 1700’s. Sometime around or soon after 1720, her Slovak ancestors moved to Szarvas from whatever Slovak town in which they used to reside. My husband’s maternal grandfather was born in Szürte, Ung county, Hungary which is now part of Ukraine. We do not have access to any records in the area so other than the names of his parents and possibly some siblings, we know very little about his family. This map and ancestry.com’s DNA database will likely match and introduce us to cousins my husband never knew he had. Zádorfalva is located where most of the pink is concentrated on the map. My husband’s maternal grandmother, Erzsébet Lenkey was born in Zádorfalva. Both of her parents were born to noble families so we have the names of many of her ancestors back as far as the 1200’s for some lines who also lived there. Zádorfalva is still in Hungary near the Slovakian border. The other towns of her ancestry are close-by in what used to be Gömör county, Hungary. Now those towns are on one side or the other of the Hungary-Slovakian border. The Hungarian names for these towns include Alsószuha, Mihályfalva, Horka, and Kövecses. The noble families of these small towns tended to stay in town generation after generation, leaving only if they married into another noble family and relocated to that family’s town. It makes perfect sense to us that this part of the map has the greatest concentration of pink. I am certain that if you took a DNA test, you would delight in the information given, too! You might also enjoy reading Ancestry.com’s research about DNA and western migration in North America. 1 + 2 + 431 + 862 = 1296 = 36² = 6⁴. 862 is a composite number. The exponents in the prime factorization are 1 and 1. Adding one to each and multiplying we get (1 + 1)(1 + 1) = 2 × 2 = 4. 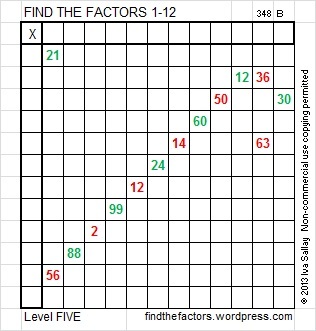 Therefore 862 has exactly 4 factors. All of these children are more puzzle pieces in the life of Kéri Mihály (Michael Keri). I’m sharing this chart even though I have not yet found all of the children’s death dates. The highlighted entries will help me explain a thing or two. I didn’t find a Kéri-Cselei marriage record or any other children for a couple with those names. Kéri Mihály and Nyilas Rebeka had a child every two to three years. There would be a five year gap if 1842 Sára is not included in the family. The couple had a previous child they named Sára who died in 1841, a year before 1842 Sára was born. 1842 Sára’s godparents were also the godparents of five of her siblings. I looked to see if Michael Keri and Rebeka were the godparents for the Sandor Josik and Rebeka Horvat’s children. They weren’t, but Sandor Josik and Rebeka Horvat also were not the godparents for any other couple from 1841 to 1843. Another mistake was obviously made recording dates for Ester who has some conflicting dates highlighted in red. I double checked all the information when I added it to the chart. If you were to follow the christening record and the death record, Ester was born on the 7th, christened on the 7th, died on the 6th, and buried on the 8th. Her death record also stated that she was 3 days old when she died. Obviously at least one of the dates is not correct. Life must have been very difficult for Michael and Rebeka Keri. A little baby usually represents much hope for the future. This couple had to witness the deaths of too many of their little ones. My heart goes out to them. 550 is the product of 10 and the 10th triangular number and is, therefore, the 10th pentagonal pyramidal number. 550 is the hypotenuse of two Pythagorean triples: 330-440-550 and 154-528-550. What is the greatest common factor of each of those triples? 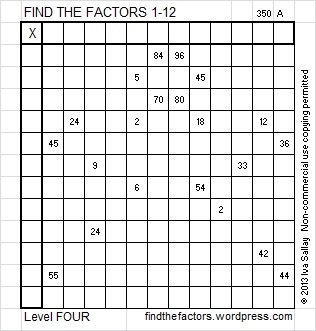 550 is a composite number. The exponents in the prime factorization are 1, 2, and 1. Adding one to each and multiplying we get (2 + 1)(1 + 1)(1 + 1) = 3 x 2 x 2 = 12. Therefore 550 has exactly 12 factors. 13 is a prime number. Prime factorization: 13 is prime. The exponent of prime number 13 is 1. Adding 1 to that exponent we get (1 + 1) = 2. 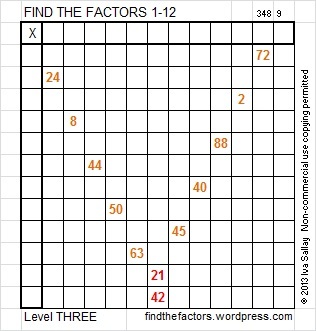 Therefore 13 has exactly 2 factors. 13 has no square factors that allow its square root to be simplified. √13 ≈ 3.60555. How do we know that 13 is a prime number? If 13 were not a prime number, then it would be divisible by at least one prime number less than or equal to √13 ≈ 3.6. Since 13 cannot be divided evenly by 2 or 3, we know that 13 is a prime number. 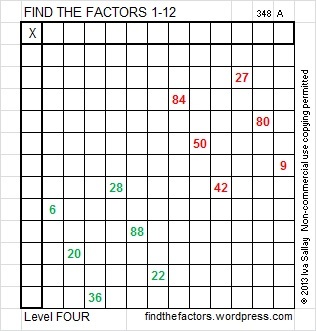 13 is never a factor in the FIND THE FACTOR 1 – 10 or 1 – 12 puzzles. Tonight (December 5th) all over Hungary, children will polish their boots and then place them in a window or in front of their door. Once the children are “nestled, all snug in their beds, … visions of sugar-plums (will indeed) dance in their heads” as they await a visit from Mikulás, or St. Nickolas. When the children get up in the morning, they will find their boots or shoes filled with candy, fruit, and nuts if they have been good. If they have been bad, their boots or shoes will be filled with virgács, a small collection of twigs that have been spray-painted gold and decoratively bound together. Since most children were good some of the time and naughty once in awhile, they will likely find the expected goodies as well as virgács in their shoes or boots. 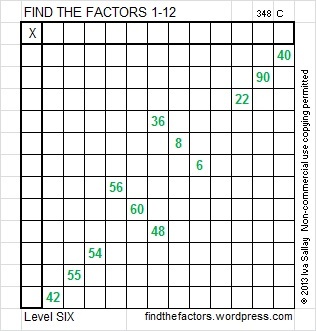 With these traditions in mind, I created the puzzles for today. If you have just a little imagination, you will be able to see different types of candy as well as the virgács in the clues. These puzzles will be a treat to any child or adult who did their homework and learned multiplication, division, and factoring. 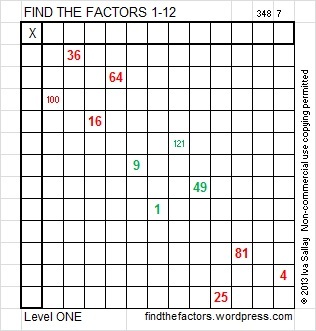 Click 12 Factors 2013-12-05.